Thank you for your interest in one of Trust Auto's online offerings. Please continue for more information regarding this 2008 Dodge Ram 3500 SLT with 217,957mi. When you purchase a vehicle with the CARFAX Buyback Guarantee, you're getting what you paid for. Want to brave the road less traveled? You'll have the 4WD capabilities to do it with this vehicle. Although this 2008 Dodge Ram 3500 SLT is technically a pre-owned vehicle, the clean and spotless interior could fool even the toughest critic. No matter the season or weather conditions, the tires on this Dodge Ram 3500 can handle the job. This Dodge Ram 3500 SLT was well-kept and pampered, which is evident by the flawless condition of its paint. A perfect find to complement any rare automotive collection. This beautiful lass will turn heads everywhere she goes. More information about the 2008 Dodge Ram 3500: The torquey Cummins turbodiesel engine that's optional on the 2008 Dodge Ram heavy duty models makes it one of the best choices for those who have to tow the heaviest loads, such as long campers or horse trailers. Dodge also says that the standard 5.7L V8 provides best-in-class acceleration and towing capability compared with competing gasoline heavy-duty pickups. Strengths of this model include Wide range of configurations, towing and hauling ability good for hard commercial duty, and available Cummins turbodiesel. *30 DAYS / 1000 MILES POWER-TRAIN WARRANTY INCLUDED (ENGINE, TRANSMISSION, DIFFERENTIALS)* *TRADE INS ARE WELCOME* Trust Auto is one of the top pre-owned vehicle dealer in Maryland. We provide quality vehicles of various makes and models with the most competitive prices in the region. Trust Auto is dedicated to make your vehicle shopping experience hassle free and straight forward. With that in mind we fully inspect, service and detail all cars in the lot. We are open 6 days a week now FOR YOU!!! Monday - Saturday 9am - 7pm. Some vehicle information and pricing may be unintentionally missing or inaccurate, and Trust Auto will endeavor to correct such discrepancies in a commercially reasonable manner after being notified of any errors. Pricing errors and listing errors are considered invalid and may not be honored at the sole discretion of Trust Auto. Prices subject to change without notice and do not include Title, License, Registration Fees, State or Local Taxes, $895 PDI & $299 Dealer Processing Fees. Please contact seller for vehicle availability. All vehicles with PDI are sold with a 30 day / 1,000 mile warranty! EPA mileage estimates are provided for comparison purposes only. Actual mileage may vary depending on driving conditions, driving habits, and vehicle maintenance. Mileage listings are estimates and are not necessarily accurate odometer readings. This 2008 Dodge Ram 3500 SLT Crew Cab 8FT Long Bed w/ 6.7L Cummins Turbodiesel Pickup Truck is offered to you for sale by Trust Auto. Your buying risks are reduced thanks to a CARFAX BuyBack Guarantee. This 4WD-equipped vehicle handles any condition on- or off-road with the sure footedness of a mountain goat. With unequaled traction and stability, you'll drive with confidence in any weather with this Dark Brown 2008 4WD Dodge Ram 3500 SLT. 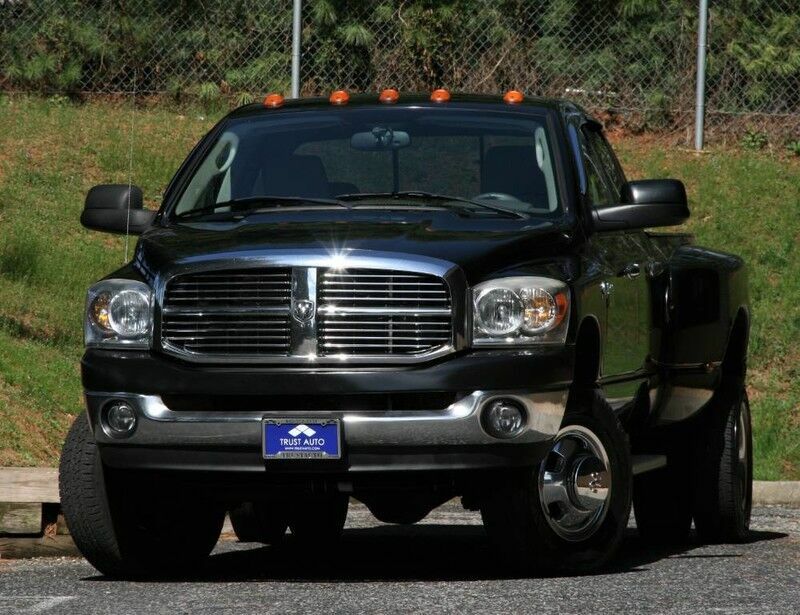 With all records included, drive away confidently knowing the complete history of this Dodge Ram 3500 SLT. If not for a few miles on the odometer you would be hard-pressed to know this 2008 Dodge Ram 3500 is a pre-owned vehicle. More information about the 2008 Dodge Ram 3500: The torquey Cummins turbodiesel engine that's optional on the 2008 Dodge Ram heavy duty models makes it one of the best choices for those who have to tow the heaviest loads, such as long campers or horse trailers. Dodge also says that the standard 5.7L V8 provides best-in-class acceleration and towing capability compared with competing gasoline heavy-duty pickups. Strengths of this model include Wide range of configurations, towing and hauling ability good for hard commercial duty, and available Cummins turbodiesel. *30 DAYS / 1000 MILES POWER-TRAIN WARRANTY INCLUDED (ENGINE, TRANSMISSION, DIFFERENTIALS)* *TRADE INS ARE WELCOME* Trust Auto is one of the top pre-owned vehicle dealer in Maryland. We provide quality vehicles of various makes and models with the most competitive prices in the region. Trust Auto is dedicated to make your vehicle shopping experience hassle free and straight forward. With that in mind we fully inspect, service and detail all cars in the lot. We are open 6 days a week now FOR YOU!!! Monday - Saturday 9am - 7pm. Some vehicle information and pricing may be unintentionally missing or inaccurate, and Trust Auto will endeavor to correct such discrepancies in a commercially reasonable manner after being notified of any errors. Pricing errors and listing errors are considered invalid and may not be honored at the sole discretion of Trust Auto. Prices subject to change without notice and do not include Title, License, Registration Fees, State or Local Taxes, $895 PDI & $299 Dealer Processing Fees. Please contact seller for vehicle availability. All vehicles with PDI are sold with a 30 day / 1,000 mile warranty! EPA mileage estimates are provided for comparison purposes only. Actual mileage may vary depending on driving conditions, driving habits, and vehicle maintenance. Mileage listings are estimates and are not necessarily accurate odometer readings.